The Iran nuclear agreement: touch and go? Britain, France and Germany, the three European signatories to the Iran nuclear agreement, are engaged in intensive negotiations with Washington and Tehran seeking a ‘supplemental agreement ’ acceptable to Iran that will also persuade the US not to withdraw as President Donald Trump has threatened to do. The US, Britain, France, Germany, Russia and China are the P5+1 signatories to the Joint Comprehensive Plan of Action (JCPOA), which was adopted by the UN Security Council as Resolution S2231  in 2015. Under US law, staying with the JCPOA requires the US president to recertify, every 90 days, Iran’s compliance with its nuclear restrictions. Failing to recertify would mean US withdrawal and the reinstatement of severe US economic sanctions. The next recertification date is 12 May. Although the IAEA has verified Iran’s full compliance with these restrictions since 2015, which has been the basis for recertification until now, Trump’s instinct has long been to dump the JCPOA. The President regards it as one of the ‘worst and most one-sided transactions ’ and says it’s full of ‘disastrous flaws’. These relate principally to the inclusion of sunset clauses and other provisions that, eventually, could allow Iran to develop nuclear weapons and related missile capability. Trump identified this possibility and Iran’s other regional ‘destabilising’ activities, as unacceptable threats to US interests, and to those of its friends and allies, in the Middle East. He flagged in October, and confirmed in January, that he’d refuse to recertify Iran’s compliance, withdraw from the agreement and resume sanctions unless the flaws were ‘fixed’. Trump identified ‘fixed’ as including provisions that prevent Iran from ever developing or acquiring nuclear weapons, and provide immediate access by IAEA inspectors to all known and suspected nuclear facilities. Also included are restrictions on the development and testing of long-range missiles—especially intercontinental ballistic missiles—and any missile designed to deliver nuclear weapons. Trump’s statements do not mandate the inclusion of action ‘countering Iranian aggression’ and ‘destabilising’ activities within the new agreement, but suggest he may link them to recertification. Initially, Trump wanted the JCPOA itself amended. However, in response to strong European opposition  to any amendment, and Iran’s blunt statement that it would withdraw from the agreement  if it were amended, or if it offered no economic benefit, Trump revised his tactics to demand a ‘supplemental agreement’, which he put on the Europeans to negotiate. Trump deliberately excluded Russia and China from the negotiations, presumably on the assumption they would agree to any outcome acceptable to Iran. The Europeans were, and remain, both frustrated and angered by Trump’s ‘deal or no deal’ move. The JCPOA was acceptable to former president Barack Obama and has worked well, so why change it? They’re aware it has shortcomings but maintain that it’s much better than no agreement. There’s also serious doubt about the realism of meeting all of Trump’s demands. If his intent is to dump the JCPOA, declining any compromise would give him the excuse. The appointment of John Bolton and Mike Pompeo, both anti-Iran hawks, to Trump’s inner advisory group could suggest this approach. The Europeans note that the JCPOA’s preamble already includes Iran’s agreement to never develop a nuclear weapons capability. Repeating that assurance should be possible. Widening the IAEA’s inspection sites might also be possible, especially if Iran has nothing to hide, and providing that the IAEA can justify in each case the reason for doing so. But the Europeans don’t believe Iran is engaged in any covert nuclear weapons development despite contrary claims this week by Israeli Prime Minister Benjamin Netanyahu, and sources claim existing IAEA and other intelligence monitoring would indicate if it was. Iran is well aware that the consequences—if it’s caught cheating—would be severe. The Europeans see attempts to formally restrict, and especially to monitor, Iran’s missile development as very challenging. Reference to missiles is included in Annex B of the JCPOA, where Iran is ‘called upon’ not to develop ballistic missiles ‘designed to be capable of delivering nuclear weapons’. But compliance in this is voluntary, not mandatory, and there are no inspection programs to review compliance. Iran has asserted that it has no nuclear weapons or any intention of getting them, and so its missiles aren’t designed to be, nor can be, nuclear capable. It also claims that all of its missiles are defensive, hence it has no need for intercontinental ballistic missiles. It says that those missiles it has have a capped range of 2,000 kilometres , enough to strike any potential regional aggressor—such as Israel or Saudi Arabia—from central Iran. Iran’s intent could change if it considers that the threat has increased. It’s highly unlikely to allow any missile development compliance inspections. Of especial concern to the Europeans (and to many other nations) are their existing and proposed economic investments in Iran. Those are substantial, and very vulnerable to any reinstatement of sanctions. The Europeans don’t assume that Trump would weigh the effects on European economic interests ahead of his own agenda if his demands weren’t met. Trump is well aware of this sensitivity. His decision also could depend on how tough a dealmaker image he wants to project to North Korea’s Kim Jong‑un. Sources claim the Europeans want to ensure that Iran’s destabilising activities are separate from the new agreement. A benign reference to all nations agreeing to pursue regional peace and security should be acceptable, but anything like Trump’s rhetoric damning Iran’s activities would kill any deal. Iran’s public response generally to these events has been constrained, but it has said it will withdraw if the JCPOA is amended or no longer offers economic value. Importantly, it has neither confirmed nor rejected publicly a supplemental agreement. If it accepts, the wording will be critical and must respect Iran as a sovereign nation , and not be insulting. 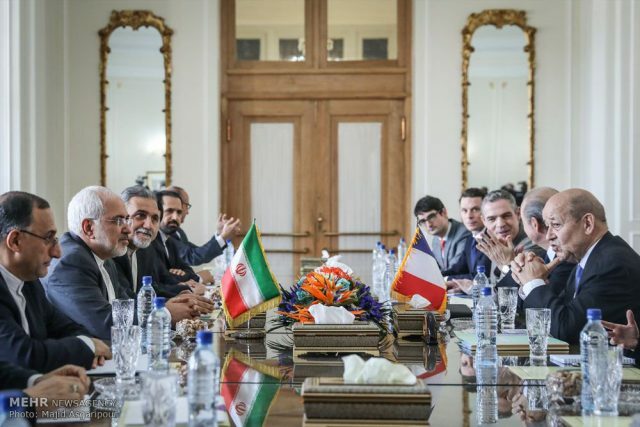 However, Iran might be very willing to concede an appropriately worded supplemental agreement with the remaining P5+1 signatories even if the US withdraws. That would allow it to promote an image of responsibility compared to Trump, indicate general distrust of the US president’s commitment to any agreement and isolate him from the Europeans. How this works out over the coming days remains to be seen. Having the US on board is the strong preference. If it withdraws, the Europeans will suffer economically due to reimposed US sanctions. Trans-Atlantic relations will also suffer. Ian Dudgeon is a presidential associate of the Australian Institute of International Affairs. Image courtesy Javad Zarif via Twitter.